What is Slate? 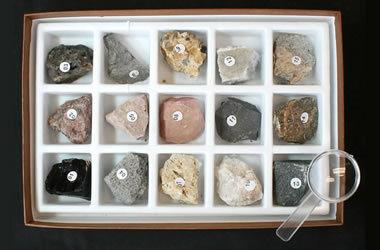 What Minerals are in Slate? What is Slate Used For? Slate is composed mainly of clay minerals or micas, depending upon the degree of metamorphism to which it has been subjected. The original clay minerals in shale alter to micas with increasing levels of heat and pressure. Slate can also contain abundant quartz and small amounts of feldspar, calcite, pyrite, hematite, and other minerals. Slate roof: Most of the slate mined throughout the world is used to produce roofing slates. Slate performs well in this application because it can be cut into thin sheets, absorbs minimal moisture, and stands up well in contact with freezing water. A disadvantage is the cost of the slate and its installation in comparison with other roofing materials. As a result, in new construction slate is mainly confined to high-end projects and prestige architecture. Image copyright iStockphoto / Iain Sarjeant. Most slates are gray in color and range in a continuum of shades from light to dark gray. 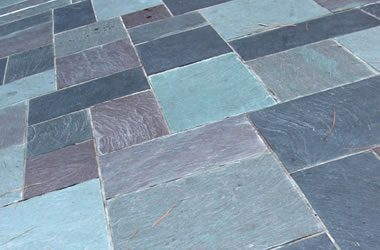 Slate also occurs in shades of green, red, black, purple, and brown. The color of slate is often determined by the amount and type of iron and organic material that are present in the rock. School slate: School slate used for writing practice and arithmetic. Students wrote on the slate with a "pencil" made from slate, soapstone, or clay. These slates were widely used until the late 1800s, when wood-case pencils were easily produced and the price of paper became affordable. Image copyright iStockphoto / Bruce Lonngren. The word "slate" has not been used consistently over time and in some industries. 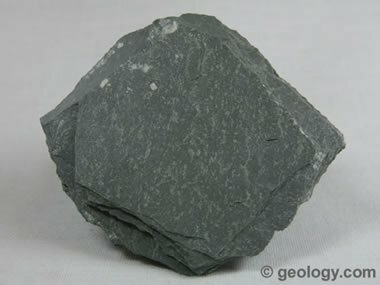 Today most geologists are careful not to use the word "slate" when talking about "shale." However, in the past the word slate was often used freely in reference for shale. This confusion of terms partially arises from the fact that shale is progressively converted into slate. Imagine driving your car eastwards in Pennsylvania through areas of increasing metamorphism, starting where the rock is definitely "shale" and stopping to examine rock at each outcrop. You will have a difficult time deciding where on that route "shale" has been converted into "slate." It can be difficult to pick up a rock and apply the proper name where the rocks have been lightly metamorphosed. In the coal mining industry of the Appalachian Basin, the word "slate" is still used by many miners in reference to the shale that forms the roof and floor of a mine, and for fragments of shale that are separated from the coal in preparation plants. Experienced miners train newer miners, and archaic language is passed along. In the 1800s, elementary school students used a small piece of slate mounted in a wooden frame for writing practice and arithmetic problems. Writing was done with a small pencil made of slate, soapstone, or clay. The slate could be wiped clean with a soft cloth. Small slates were also used in schools and businesses to list daily events, schedules, menus, prices, and other notices. 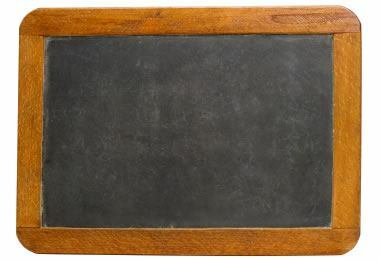 Today, over 150 years after writing slates started to disappear from schools, the word "slate" is still used in phrases such as "clean slate," "wipe the slate clean," "slated for today," "put it on the slate" and more. 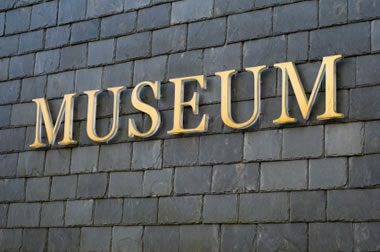 Slate siding: Slate is sometimes used as facing stone on building exteriors. Image copyright iStockphoto / John Bloor. Foliation in slate is caused by the parallel orientation of platy minerals in the rock, such as microscopic grains of clay minerals and mica. These parallel mineral grain alignments give the rock an ability to break smoothly along planes of foliation. People exploit this property of slate to produce thin sheets of slate that are used in construction projects and manufacturing. Slate tile flooring: Slate is a durable rock that is suitable for use as flooring, stair treads, sidewalk slabs, and patio stone. It is also produced in a variety of colors that allow it to be incorporated into a variety of design projects. Shown above are multi-color flooring tiles. Image copyright iStockphoto / Chad Truemper. Most of the slate mined throughout the world is used to produce roofing slates. Slate performs well in this application because it can be cut into thin sheets, absorbs minimal moisture, and stands up well in contact with freezing water. 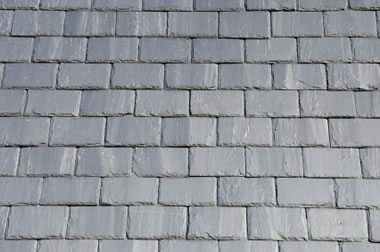 A disadvantage is the cost of the slate and its installation in comparison with other roofing materials. As a result, in new construction slate is mainly confined to high-end projects and prestige architecture. Slate is also used for interior flooring, exterior paving, dimension stone, and decorative aggregate. Small pieces of slate are also used to make turkey calls. The photos on this page document several uses of slate. Historically slate has been used for chalkboards, student writing slates, billiard tables, cemetery markers, whetstones, and table tops. Because it is a good electrical insulator, it was also used for early electric panels and switch boxes.